This article is a review of DJANGO UNCHAINED. Arguably a companion piece to INGLOURIOUS BASTERDS, both deal with catharsis, lesson-dealing and vengeance, Quentin Tarantino has assembled a crack team to revise history again. Those before the lens are, as with a Terrence Malick/Woody Allen/Martin Scorsese flick, a cornucopia of gifted and magnetic actors. And like Christopher Nolan’s casting choices, there are the actors who’ve fallen from cinema screens that are given a gentle career boost. The choices don’t feel like a stunt or charity, rather the wide-ranging familiar faces make for a richer filmic experience. But what about those behind the camera? Scorsese and Oliver Stone regular Robert Richardson is again on cinematographer duties; while J. Michael Riva is production designer (LETHAL WEAPON). The genuine talent is all in place. 1858, two years before the American civil war, the Deep South of the USA. After the retro credits and logo, we meet in a wood the brilliant, and real star of this movie, Christoph Waltz. Waltz’s Dr King Schultz is a dentist turned bounty hunter. We can’t speak for Schultz’s skills in his previous profession, but he certainly appears adroit at this calling. Like the Vega brothers, or Aldo Raine, he is so fascinating, a spin-off film would be welcome. 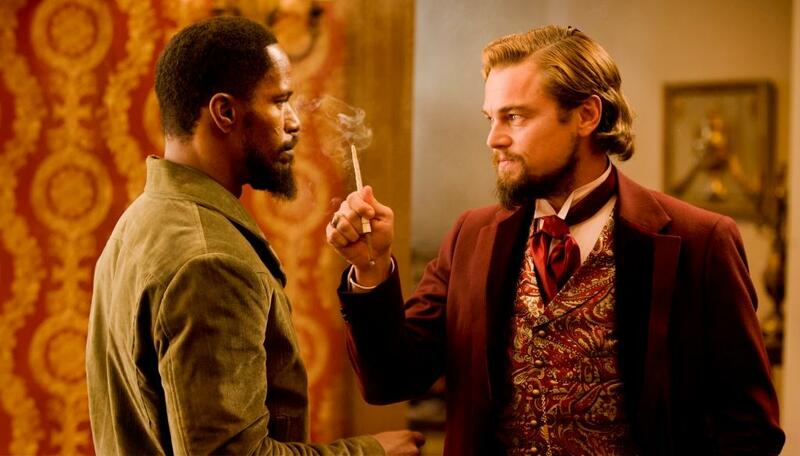 Epitomising confident purpose, and acting within the letter of the law, as opposed to the spirit, he takes Jamie Foxx’s titular Django off the hands of two rather belligerent slave traders. Belligerence is the watchword, every character seems insistent on truculence, some far more justified than others. The poster tagline for KILL BILL VOLUME ONE: “A roaring rampage of revenge.” That marketing line might be argued to be applicable to any Tarantino project. Here the venom is searing. For the audience members who needed reminding, the abhorrence of slavery is presented in brutal cruelty. The basic plot is simple. 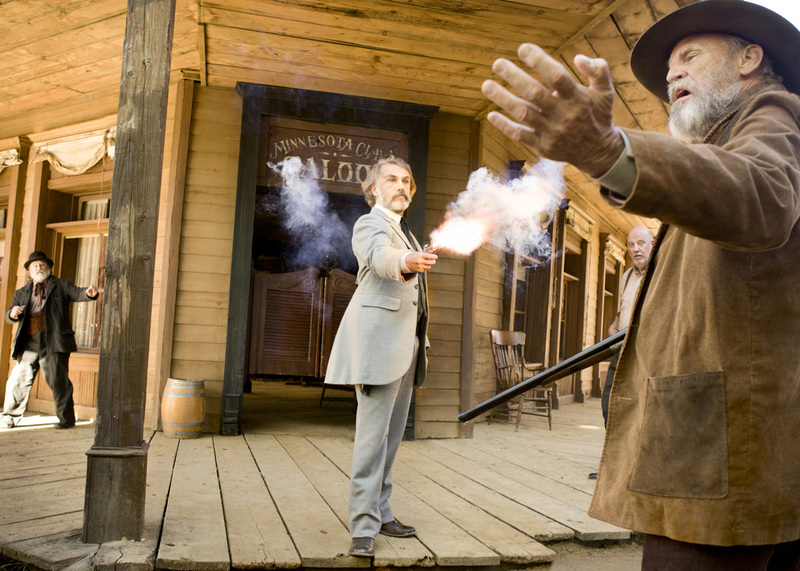 Dr Schultz needs Django to identify three wanted brothers, whom he desires to kill for the reward. In exchange he will give the lead his freedom. 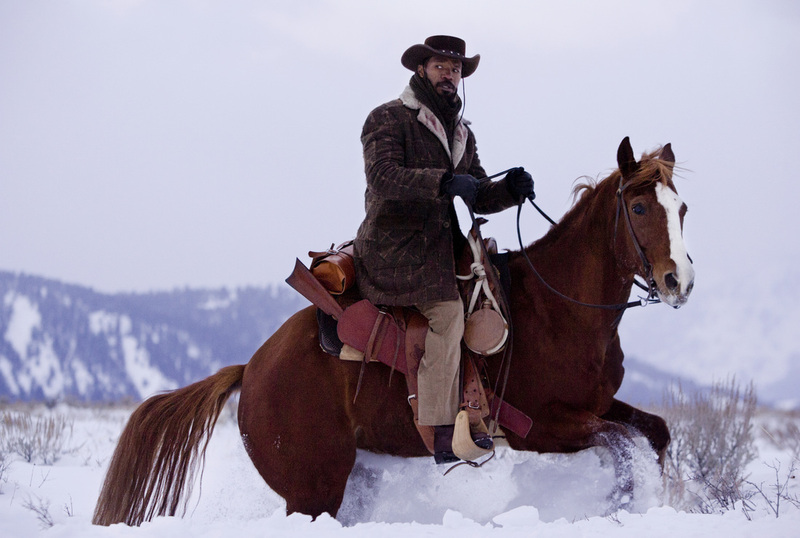 Like a heist flick, the teamwork of Django-Schultz is portrayed in blood-soaked chutzpah. 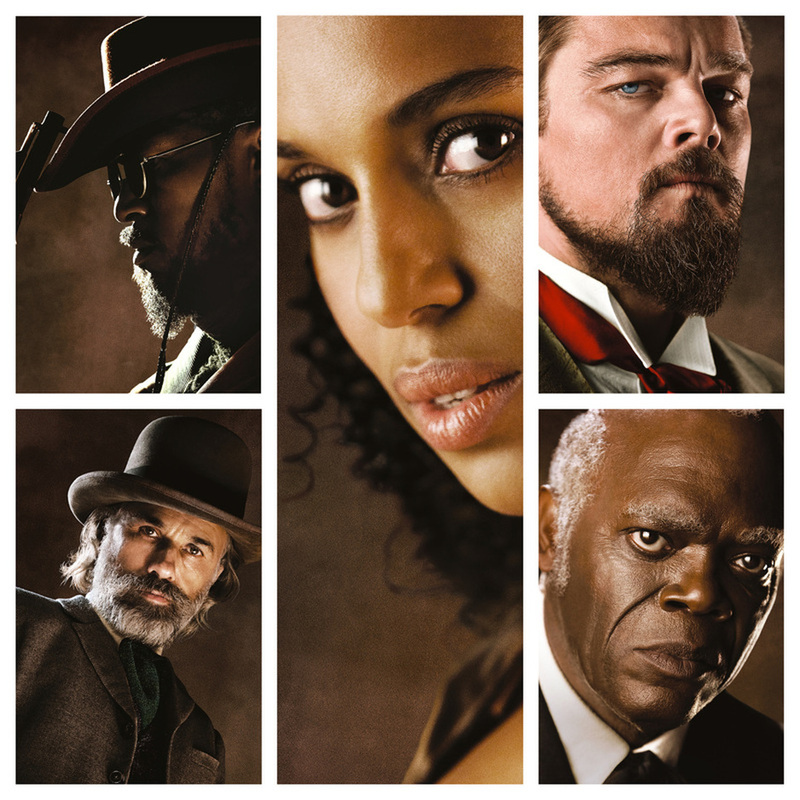 They bond, and the ex-dentist agrees to assist the ex-slave rescue his wife, Broomhilda (Kerry Washington), from barbarous Francophile Mississippi plantation owner Calvin Candie – the scene-masticating Leonardo DiCaprio. Clocking in at 165 minutes, you don’t feel that time, as hell fire pores down. To say the unexpected happens is a no-brainer. Bar DEATH PROOF and his FOUR ROOMS segment, Quentin Tarantino’s oeuvre exudes panache and élan, and DJANGO UNCHAINED is no exception.